Saiterm Smarter Innovation | Installed power. Reduced to a minimum. Installed power. Reduced to a minimum. 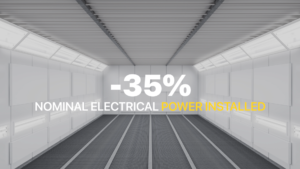 – 35%.Less nominal electric power installed. Even the installed power, which until today was a real limit for these applications, has been reduced by 35%, allowing an ever growing number of body shops to take advantage of this technology. Saiterm aims to develop cutting-edge technology products, designed to reduce energy consumption and emissions.